1. 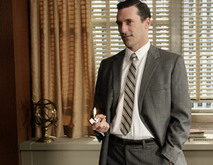 All men were unfaithful, screwing their way around the office. 2. All women tolerated this behavior, because they were so busy scheming and conniving to trap a man into marriage. 3. Everyone smoked, constantly. Everyone drank, a lot. 4. Nobody really talked about anything. A. A little girl was playing by walking around with a plastic bag over her head. Her mom scolded her, not for almost suffocating herself, but for leaving the mom's cleaning on the floor. B. When a wife visited a shrink, the doctor called the husband later to tell him every single thing that the woman said. So much for doctor-patient confidentiality. Aren't you glad that there isn't, like, some giant, globe-sized time machine that can hurl the whole planet back into the year 1960? If there were, we'd never, ever be watching a show like Big Love, that's for sure! This week, "Kingdom Come," was very juicy, and it became clear that Margene is the sexual Bad Girl, Nicki is the Good Girl, and Barb, well, she's just no longer a girl. Also becoming more and more reminiscent of The Sopranos, only with nutty, polygamous Mormons instead of corpulent, hypocritical Italians. I don't know how the show can survive, dramatically, without Evil Roman to hate. But he's been shot by the crazed-female duo from the even-more-insane polygamous sect headed by the Greens. And it looked fatal to me, though maybe he'll just have a really long, really-TV-unrealistic recovery period. 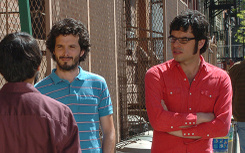 Then, there's Flight of the Conchords. This week's episode, "Drive By," is all about prejudice. The East Asian guy who sells fruit won't sell an apple and a banana to Germaine and Bret because he doesn't like their kind. Meaning New Zealanders. Their dense friend, Dave, explains the facts of American life to them. "There's a lot of prejudism here. Especially toward people like you, the English and whatnot, red coats, oppressors. You're pretty much the most disliked race in this whole country." "What about black people," Germaine asks. "They don't like you either." It turns out that the fruit guy was simply confusing the boys with Australians, the people he actually hates. Meanwhile, the guys are watching a tape from home, with their favorite TV shows, including "The Dog Show," "What've You Done With My Hat?" and my favorite, "Albi, the Racist Dragon." This is random; also, hilarious. Despite the absence of any Boomers whatsoever.